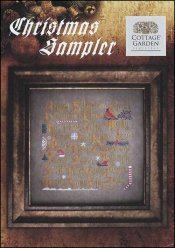 Christmas Sampler [C5913] - $10.50 : Yarn Tree, Your wholesale source for cross stitch supplies. Cross stitch design by Cottage Garden Samplings. Christmas motifs are stitched throughout the sampler. Each letter of the alphabet has a Christmas themed word by it. Some of the words are Elves, Holly, Merry, Noel, Rudolph, and Yule. Stitch count 160w x 157h. Stitched on 32ct Linen.